Fishing Party on Long Island Sound off New Rochelle is one of the finest example of James Goodwyn Clonney’s genre painting. The artist admirably combines a theme centred on the simple life of the inhabitants of the small coastal town of New Rochelle with a formal aesthetic that is close to Luminism. It is undeniable that Clonney drew from the painters Georg Caleb Bingham and William Sidney Mount, the first to reconcile classical order and serenity with rural themes. The painting in the Museo Thyssen-Bornemisza is very similar in composition to Bingham’s Fur Traders Descending the Missouri, a theme that denotes a certain nostalgia for the river scenes of previous periods while displaying formal features that recall Luminism and the painting of Mount, such as Eel Spearing at Setauket. The painting depicts a fishing party on Long Island Sound. Three fishermen in a small boat in the centre of the composition are subjected to three opposite lines of force: the rod that rotrudes from the boat on the left side; the anchor rope on the right; and the line clutched by the boy in the centre, the tautness of which indicates that a fish has just taken the bait. The people depicted in the painting had already been portrayed in earlier works: an elderly man in a top hat; a boy with a round, flat face and a certain air of caricature about him; and a young black man lying in the pose of an antique faun. Unlike the paintings of Bingham and Mount, Clonney’s work has a characteristic element of humour, as borne out by the penetrating, sceptical gaze the man directs at the boy and the carefree attitude of the reclining figure at the stern. Nevertheless, the slightly grotesque tone of the action is tempered by the minute and calm handling of the background scenery bathed in golden light. 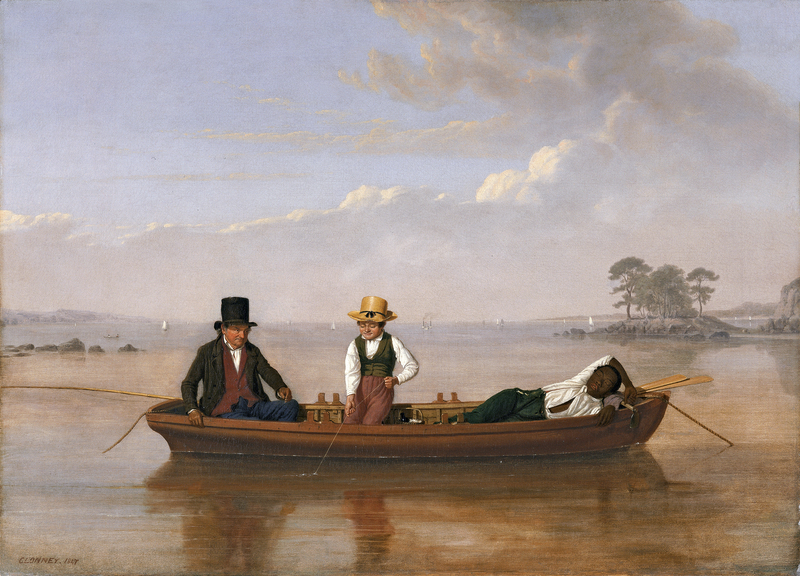 According to Lucretia H. Giese, a scholar of Clonney’s work, the painting in the Thyssen-Bornemisza collection was shown at the American Academy of Fine Arts in 1847, with the title Fishing. On the Sound.